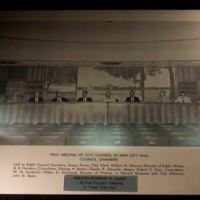 Mayor Bob Carr (1899-1967) at the first Orlando City Council meeting in the new 1958 Orlando City Hall in Downtown Orlando, Florida. Photographed, from left to right, are: Grace Avera, council secretary; William G. Stewart, city clerk; A. B. Herndon, Director of Public Works; George A. Baker, councilman; Claude R. Edwards (ca. 1922-2002), who later became a judge for the Ninth Judicial Circuit Court of Florida; Mayor Carr; W. M. Sanderlin (b. ca. 1925), councilman; Wilbur H. Strickland; J. Edward Greaves, Director of Finance, and John G. Baker, city attorney. The city hall was built in 1958 and was later demolished in 1991. Mayor Carr was mayor when the greatest growth took place in Orlando with Walt Disney (1901-1966) announcing plans to build the Walt Disney World Resort just outside the city. In 1967, Mayor Carr died from a heart attack while still in office. Original color photographic print: Orlando Remembered Exhibit, Orlando City Hall, Orlando, Florida. "Orlando City Hall.” Controlled-demolition.com. Accessed April 7, 2016. http://www.controlled-demolition.com/orlando-city-hall. Allman, T. D. "Beyond Disney." National Geographic. http://ngm.nationalgeographic.com/2007/03/orlando/allman-text. 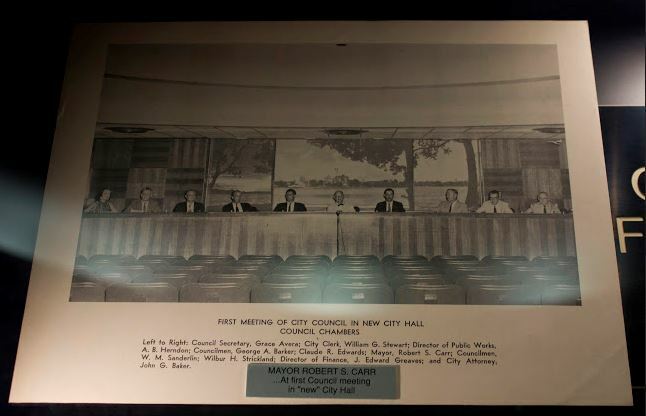 “Mayor Bob Carr at the First Orlando City Council Meeting in the New Orlando City Hall.” RICHES of Central Florida accessed April 25, 2019, https://richesmi.cah.ucf.edu/omeka/items/show/7874.